Sat Aug 26, 2017 - Brewer Park *All players are asked to arrive a half hour before their first game below (7:30 arrivals for kids/youth and 9:30am arrival for adult players) in order to sign in at our registration table and pose for a team photo. *All players will be asked to sign a waiver form. Games will be played by slo-pitch lo-ball rules. HOC volunteers will be on hand in red t-shirts to answer any questions you may have. Since there are some parents participating in the adult games after the kids’ game is finished it is important that young children are not left unsupervised during these hours. There are several children’s activities on hand to keep them occupied but at least one adult must remain with them at all times. Parking: Limited parking is available on the south-west corner of Brewer Park where our tournament is being held. Where possible, players are encouraged to car pool. Please do not park in the spots marked with pylons when you arrive as these are being reserved for our special guests. BBQ: Additional hotdogs and drinks will be available at a small cost for siblings/spectators but softball participants and those wearing a CHEO wristband will be served first. What to bring: Lawnchairs (there are no picnic tables in this area of the park), blankets to sit on, hats, sunscreen, bug spray, water bottles and raingear. You may also wish to bring pocket change with you for our 50/50 draw, lottery board and auction items. Thanks to our generous community sponsors we have many COOL items on hand! All participants will have their name put into a draw for the opportunity to win PRIZES! 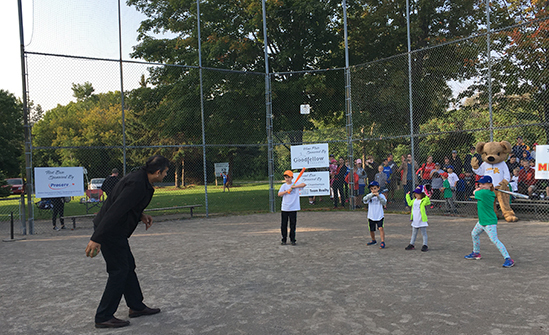 On Aug 26, 2017, the Heart of Champions Planning Committee will be hosting its first ever coed softball tournament for youth and adults at Brewer Park. This year’s event is part of a special fundraising initiative undertaken in partnership with the CHEO Foundation and Canadian Pacific (CP). All monies raised at the upcoming HOC event will be matched up to $10K as part of CP’s ongoing CP Has Heart project and efforts to renovate CHEO’s outdated catheterization lab and intervention suite. The HOC is proud to be a part of this important initiative. On behalf of our extend support team of cardiac families throughout Eastern Ontario, we thank our community sponsors and volunteers for their continued support! 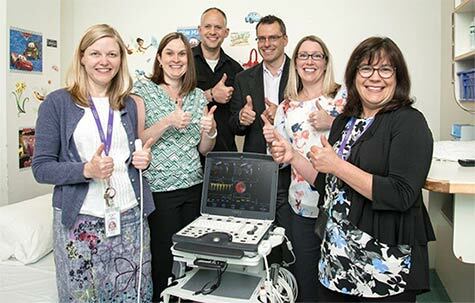 After six years of hosting the Heart of Champions Golf Tournament for CHEO's Cardiology Department, event organizers made a wish come true for CHEO’s Cardiology Department with the purchase of a new portable echocardiogram machine. Thanks to the support of generous HOC’s sponsors over the years, this machine will help save additional lives through early detection of cardiac issues in children, as well as enhancing the cardiac care provided to patients in remote areas of the north. Thank you to all of our HOC supporters through the years who helped us purchase this important medical equipment for CHEO! (Pictured left to right in a special presentation of the equipment are Chief of Cardiology Department, Dr. Jane Lougheed, cardiac parents and HOC founders Heather and Graham Irvine, HOC Director, Chris Tymofichuk and the heart behind HOC, committee member Jennifer Patton, and nurse Lynn Lynch). It’s official!! 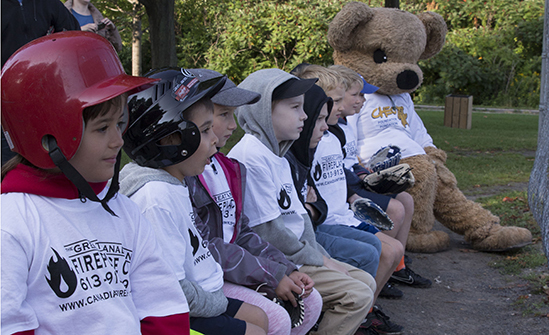 The Heart of Champions community reached its goal for CHEO Cardiology. In December 2014, HOC presented the CHEO Foundation with a cheque that meant Cardiology now had $60,000 for a new Echocardio machine!! This would not have been possible without our many supporters, players, donors and sponsors. Untold numbers of young children will benefit from the collective efforts of our community. We are so proud of everyone involved over the years. With this equipment, Heart of Champions will share in a legacy that will last for many, many years. However, one day in the future, you may hear from us and a future event to continue that legacy even further. Let’s just say it may involve some fancy shoes…. Katherine Dines of MAGIC 100.3fm (and fellow heart Mom!) takes a spin at CHEO Cardiology on a new plasma car purchased by HOC tournie funds!!! So wonderful to see HOC efforts coming to fruition just in time for Christmas!!! The new plasma cars are just one of the recent items purchased by Cardiology from HOC proceeds. A new portable echocardiogram machine is not far off! Thank you to all our generous community sponsors who made this and much more possible. Big Kudos to Timothy Kimber of Plasmart who in turn has kindly donated a fleet of plasma cars to CH EO. There really is a Santa Claus!!!! Thank you to all of you who came out and supported Heart of Champions on Saturday, June 14, 2014! Once the signs were taken down, the prizes handed out and the lucky balls packed away, every dollar collected for CHEO Cardiology was counted. The result was a very impressive $13,600 being raised this year!!! More importantly, the addition of this year’s total to our 5 year running total has now put the overall total above $60,000!!! Our goal when we started 6 years ago was to raise $50,000 and we thought that was an aggressive target. What we didn't count on was the absolute generosity of the players, sponsors, volunteers and community to help us achieve that goal. We have seen some truly inspiring moments over the years. And we can happily say it really is "for the kids". Just how many children will benefit from your efforts for the foreseeable future can only be imagined. You can fly, you can fly! CHEO's Cardiology Department has begun utilizing the funds raised by the Heart of Champions Golf Tournament to improve the every day experience of local cardiac children and their families. The proceeds from the 2010 golf tournament were presented to Dr. Jane Lougheed, Head of CHEO's Cardiology Department, in a presentation before the cardiac team in November 2010. Members of the department recently purchased new decor for several examinations rooms from the proceeds. The exam rooms are currently decorated in early 1990s motif. The Cardiology Department plans to create theme rooms based on the planets, safari, aquatics, and farm animals and expend further proceeds on movies and cartoons to bring additional comfort to children during their routine cardiac examinations and lengthy hospital stays. Some long-term plans include the purchase of new comfortable chairs for parents and new activity tables for the children in the waiting areas. The remaining proceeds raised by the Heart of Champions Golf Tournament will be invested towards the committee's long-term goal of purchasing a portable echocardiogram machine for use throughout the hospital and in remote areas CHEO services in the north. Check out some of the improvements being made to CHEO's examination rooms. Photo Cutline: The Heart of Champion Planning Committee presents the 2010 golf proceeds to Dr. Jane Lougheed, Chief Cardiologist at the Children’s Hospital of Eastern Ontario (CHEO). 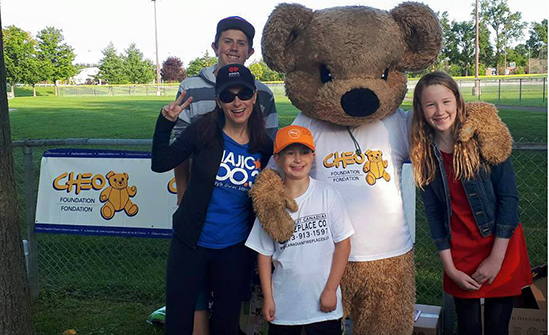 November 2010, The Heart of Champions Golf Tournament was featured on page 8 of the CHEO Foundation Teddy Bear Times Fall publication! Youth (10-14) four spots remaining! Service lavage de vitres enr. Division of / de 2784319 Canada Inc.
J.R. Willis Electrical Contracting Ltd. The Great Canadian Fireplace Co. The Committee’s overall fundraising goal is to purchase a portable echocardiogram machine for use throughout CHEO as well as in remote areas CHEO services in the North. To date, some funds have been used for the purchase of new comfortable chairs for parents and will soon include new activity tables for the children in the waiting areas.